Most of this page is oriented to the 944 series but fuel lines for all pcars are similar. Our cars are 25 years old and they are prone to fires. If you keep up on current events, you know this is true. I'll predict that its going to get bad - really bad as these cars are now well beyond their design life and the fuel lines were not well designed in the first place. We can probably all survive the loss of our car projects, it would be painful but occasionally we all have to let something go and move on. But when one of these puppies goes up in flames it may take more than a few thousand dollars to replace it. The fire could take your garage or even your house. I've been in a couple of situations with aircraft fuel fires and learned how terrifying it can be to see little fires turn instantly into big fires. There's a couple of guys out there already making and marketing fuel lines. I like to think with a little DIY attitude and some careful planning I can come up with something a little better, a little different and a lot cheaper. This page is all about doing that. Along the way I will offer the parts and you can build your own fuel lines or just a little insight for when you're ready for your own unique approach. First a warning. Number one on this project is safety, I know that's corny but it is really is a big deal. A friend of mine burned down his new garage doing a project like this. After working late on his truck, he got up early and headed into work. He had left a fuel line open but it wasn't leaking so he didn't think anything of it. As the heat of the day increased temperatures, his fuel (in the tank) expanded and flowed out of the open line onto the floor. The vapor made its way to the water heater pilot and ...whoosh. It was a windy fall day and it could have been much worse. As it was, he lost his garage, truck and melted the vinyl siding off of his house. The neighbors got quite a scare too. The lesson is simple, don't underestimate the potential for fire. I started this thing thinking how bad can this be - its just fuel line? Well that is true but there are few surprises. The first problem is mating up to the fuel rail. Porsche uses a rather overkill style of fitting known as globe-seal. These are similar to what can be found on acetylene (cutting torch) fittings. With that they used a crimp collar to secure the rubber line to the fitting. That's good until it comes time to replace the rubber line - you'll have to cut off the collar to remove the fitting. Finding a replacement or an alternative to these fittings is the first challenge. There are a few choices on what type of fuel fittings and hose you can choose. For the fittings, there are several general types from which to choose: crimped (swaged), push-on, Push-Lok, flared and threaded collar. You'll also have several choices on which hose to use; steel or aluminum hard-line, and a couple of different grades of rubber hose. There are also all kinds of factors that limit the choices too. Things like: cost, availability, durability, suitability to gasoline and pressure, temperature environment, repairability. The list goes on and on. The more I learned about this stuff, the more I realized how little I know. Even if you find the perfect combination of parts, there are still potential problems. 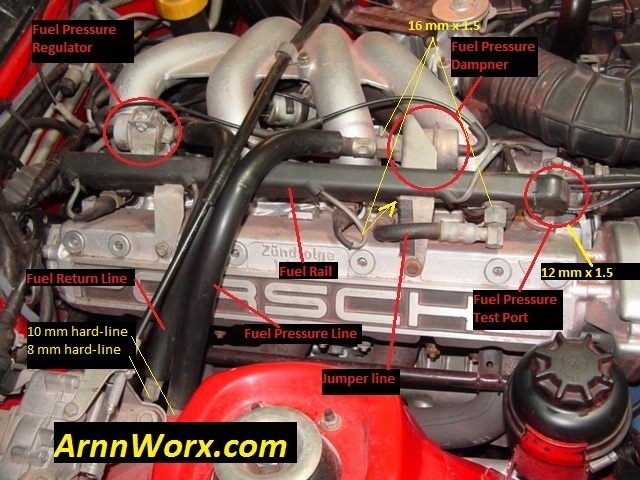 For instance, Porsche recalled thousands of the jumper lines (seen above) for poorly crimped fittings. The only point here is that even professionally prepared hose/fitting connections are subject to problems. All of the above brought me to the idea that I should seek out a professional. So I set out to get a pair of fuel lines made up at a local hydraulic shop. The guys there took one look at what I wanted and said "thanks but no thanks." One, they don't want to take the time to order weird little metric fittings. Even with the metric fittings on hand they may not have metric dies to do the crimping. Two, they don't like DIY guys - they're hard to work with, usually don't know what they want and don't know the lingo. And three, anything fuel related has potential for legal problems far bigger than just a leaky connection. So, I'm back where I started looking for answers and something I can do myself. One simple fitting I kept coming back to is called Push-Lok. Push-Lok is a trade name and relatively new (from the late seventies). It is worthy of at least a quick look as it was used on a number of Porsche models. Essentially it uses a multi-barbed fitting with pronounced barbs. It is for use with close tolerance rubber or plastic hose and without any clamps or crimped collars. Push-Lok fittings are rated for systems up to 250 psi. Considerations for heat and type of liquid (gasoline) bring this down to about 200 psi. The 944 fuel system reaches a maximum of about 55 psi, so Push-Lok is a candidate. If you've never looked at this kind of fitting, you might think it "needs something" to secure the rubber hose to the fitting. Its true that the hose can be separated, but you'll need a sharp blade because it won't just pull off. I've tried. I should also mention the hose is special. Its not the standard grade fuel line you used on your mini-bike. Its very tough. If you're thinking "heck, I'll add a clamp just to be safe," that might be defeating the design of the fitting as clamps tend to gather the hose slightly and thereby create weak spots in the barb to inner-liner seal. Push-Lok is also DIY friendly and moderate in cost. The hose is about $5 a foot (in quantity) and the fittings can be found if you look. Assembling a Push-Lok connection is easy too, especially with a few tricks. These fittings are coated steel and very tough. I have these fittings in stock. 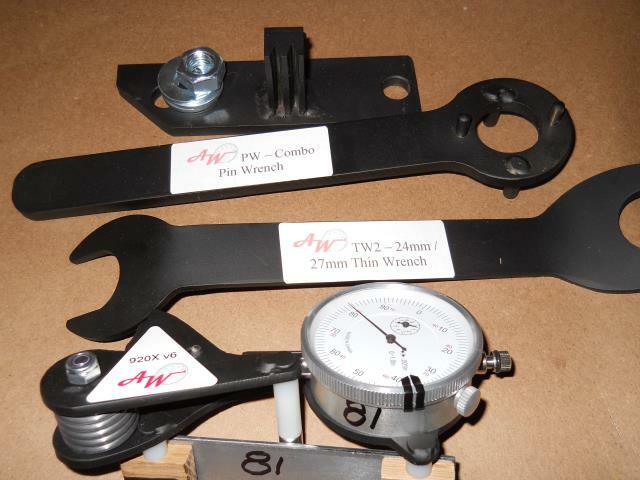 Above are another example of push-Lok fitting on a Porsche (928). In this case they do have a collar but it is not swaged at all, really its just a finish ring. 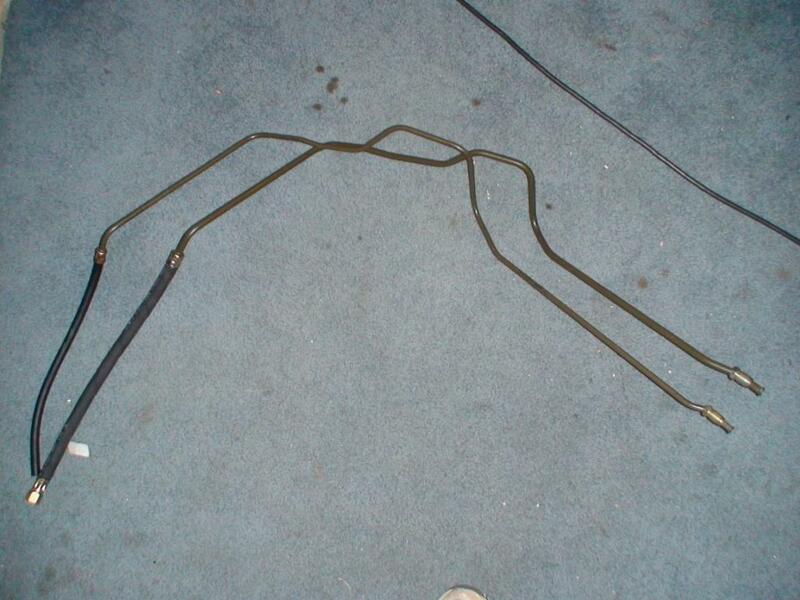 One other small point, of the two fuel lines in the original Porsche 944 setup - the return line is a low pressure line and uses a push-on fitting. That line dumps into the fuel tank and only serves to return un-needed fuel. The OEM setup uses a clamp to secure that line to the regulator. That regulator fitting is commonly known as a "push-on" fitting. Push-on fittings have been around a long time and its not surprising that Porsche would use it, especially on the low pressure return line. Most of the Porsche OEM fittings are essentially push-on fittings (either multi-barbed or single-barbed) but with a crimped collar (instead of a clamp) for added security. have a more limited bend radius. I've repaired enough of these lines in my regular job that I've learned to hate them. These fittings come in a variety of colors and are very pretty. They are repairable and although this one is aluminum, they are tough. Unfortunately they are expensive, this one fitting costs $30. These are very popular and use a 37 degree flare. They are mostly found in aluminum with adapters available to just about all other fitting types. Adapter to globe seal are the most difficult to find though. 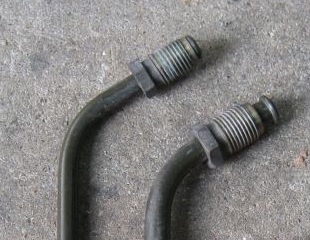 These are used to connect a hose to a seamless hard-line. They use a compression nut to collapse a bite ring and make a seal. They are available in both coated steel and 303 stainless steel. They can be over-tightened (meaning some care is needed to install them) and if damaged they have to be replaced. Replacement means cutting (shortening) that part of the hard-line where the old bite-ring was attached. 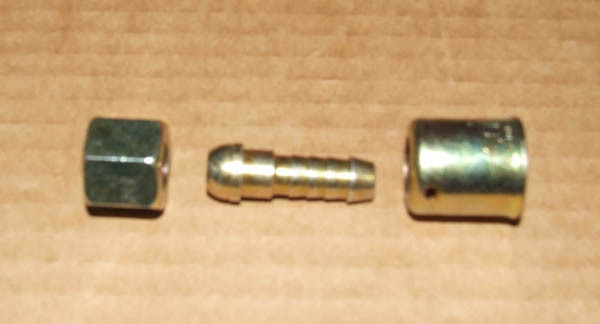 Above left is 8 & 10 mm bite ring to NPT adapters. Above right is also a bit ring in 8 & 10 mm to 1/4 & 3/8 push-lok adapter. These are most commonly used to join the 944 hard lines to the rubber hoses. Yes, Porsche does make replacement fuel lines. I believe these cost about $300 and use a bite-ring union connector to "join-up" with the original fuel lines. open the fuel rail drain port and the fuel filter and drain the fuel - best to do this when the tank is almost empty and use compressed air to push the fuel out of both the low and high pressure lines. From there a small diamond cutting blade will make quick work of the old fitting collars. If you go with this option, you'll have use of the formed bead at the end of the steel lines. Why would you want that? Well, it opens the door to using a clamped fitting connection. I know, clamped fittings are not ideal but if you're on a really tight budget, this will save some money. 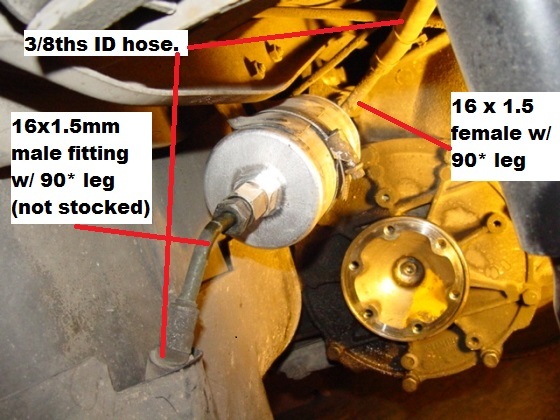 A carefully placed clamped fitting can handle pressures of 55 psi. Or drain the fuel rail at the drain port and then use a small pipe cutter (no sparks) to cut the end off of the steel lines. You'll need bite-ring fittings to join to the remaining steel line. Doing this also means removing the right front wheel and the plastic inner fender (more work). You should have some temporary way to plug those lines. The best way I've found for removing the crimped collars is to use a die grinder and a small diamond blade. Luckily these blades have come way down in price. About one per collar is needed and they make the job easy. They will do well even mounted to a simple drill. One other note on the hard lines: sometime during 1989, Porsche dropped the crimped push-on fitting for the connection between the hard lines and the rubber lines. In the grey photo above you can see they went to a flared fitting. General Info: the hard lines are 8 & 10 mm OD. Ideal rubber hose size to fit with these metric lines is 5/16ths and 3/8ths inch ID. Cutting the fitting at the dampner end is not so easy. Here you can see how I tried to make the same cut and ended up getting into the barrel of the fitting. Using this damaged fitting would be certain disaster. Heat is a consideration - especially since the fuel lines are routed right over the exhaust manifold. You can avoid some of the heat by routing the lines to the aft part of the engine. This can be improved a bit more by bending the steel lines to "point" aft (shown in pic above). Note: for the longer "aft" routing, the fuel regulator must be removed, flipped over and re-installed. It's vacuum line also has to be shortened. One downside on the aft routing - a longer trip to the rail means more opportunity for fuel to absorb heat. I like to use this black fiberglass sleeve, it looks good and can stand up to 1200 degree f. The aluminum fabric together with some loose fill fiberglass insulation is even better. You can also remove the rubber covering from the original lines. The jumper line was subject to a Porsche safety recall. You might check in with your local dealer to confirm that your car has received it's replacement jumper line. The originals were over-crimped and resulted in a number of fires. These lines cost about $125 and although you could make one using a pair of the 90 degree fittings for a fraction of that cost, it wouldn't fit in its original position. The jumper line can be eliminated, huh? Yes the jumper can be deleted. If you choose this option, you will need to rout your pressure line directly into the fuel rail. This might seem strange but a number of guys have done this with no reported side effects.